It is vitally important to ensure the maximum performance of the adhesive or tape is achieved, so we have put together this ‘best working practice’ for adhesive surface preparation. After selecting the correct adhesive, surface preparation is the most important thing you can do to achieve sufficient bond. 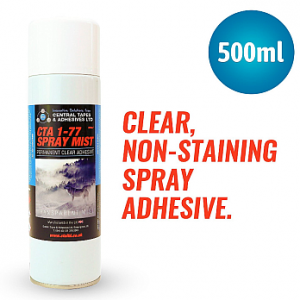 This is because adhesives adhere to surfaces, and surfaces are often covered with dust, dirt, grease, oil, oxide films, rust inhibitors, and in the case of plastics, mould release agents. All these contaminants, even at a microscopic level, interfere with the adhesive doing its job. In fact, poor surface prep is the number one reason for bond failure. For the strongest and most durable bonds, the goal is to apply adhesive to the substrate itself. However, often there are layers of surface contaminants that obstruct the surface. The ‘loose’ layer is all dust, dirt, and other loose particles. Beneath the loose layer lies surface oils and grease. Finally, there is sometimes an embedded layer clinging firmly to the surface such as rust, other oxide films, rust inhibitors, additives that have migrated to the surface such as mould release agents, and surface coatings like paint and sealants. All of the aforementioned prevent a strong bond, which is why surface preparation is so important. How much surface preparation do I need? 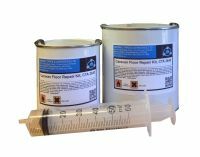 Below are our recommendations for preparing surfaces for adhesive bonding. Please note that all manufactured materials vary significantly, even within the same type, as a result of different additives and methods used in the manufacturing process. This is especially true for plastics. Always test first on samples to determine suitability. As a general rule, the more surface prep you do, the stronger and more durable a bond. Minimal surface prep, such as wiping the area clean, might be fine for simple bonds. For structural strength bonds, more treatment is required. The next step you can do is to degrease the surface. Degreasing removes all traces of oil and grease (even relatively clean surfaces have oils from fingerprints). If possible, use a solvent such as methyl ethyl ketone (MEK), acetone, or isopropyl alcohol CTA IPA. Wipe the surface clean in one direction. 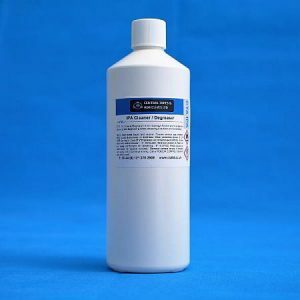 We recommend degreasing whenever possible, because surface oil or grease will get in the way of almost all adhesives and weaken adhesion (with the exception of methacrylates). 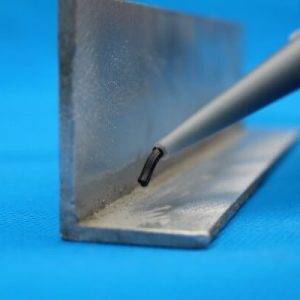 How to test if your surface is clean and degreased: For many surfaces, especially metals, a simple test to determine if your surface is clean and degreased is to drip a few drops of water on the cleaned area. If the water spreads to cover the area with a continuous film, the bond area is clean. If the water beads, that means the surface needs to be degreased further. Remember that all surfaces need to be dry before bonding. Also, bond the surfaces as soon as is practical after cleaning and degreasing to avoid having a re-contaminated surface. 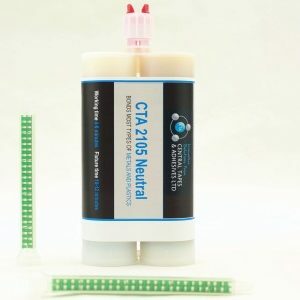 Also this test will not work well for certain plastics, because the water might bead, even though the surface is not clean enough for bonding. For the strongest and most durable bonds possible, we also recommend abrading. Abrading a surface gets rid of surface films, mill scale, paint, and oxides and also gives a much better area for the adhesive to “grip”. We only recommend abrading if practical for the material you are bonding. Use fine grain sand paper (120-200 grit), emery cloth, steel wool, or grit blasting. Abrade enough just to clean and roughen the surface. After an abrasion treatment, remember to remove all loose particles before applying adhesive. Brush the surface or blow with compressed air, and then degrease to clear away all loose particles and residual oils. Abrading and degreasing is enough surface preparation for all but the most demanding industrial applications. Finally, some materials are simply difficult to bond. These include EPDM rubber, and “polyolefin” plastics (such as polyethylene, polypropylene, acetal, and hard nylon). Also, some metals such as copper, stainless steel, and aluminum are slightly more challenging to bond than other metals. If you are bonding these materials, you might need to change the surface properties or tension to get good adhesion. Specifically, these are considered low surface energy surfaces, and you need to alter the surface to increase the surface energy. This involves using chemical primers, scorching the surface, grit blasting, or acid etching the surface. Because all materials are slightly different, please call for advice or use our chat box to speak to an advisor. Always first determine if a solvent can be used without harming your material, especially in the case of plastics. Also, note that organic solvents are highly flammable. Follow all safety instructions and local regulations when using such solvents. Surface preparation can be critical to achieving a satisfactory bond. Feel free to call our technical team to discuss any questions you may have.